1,326,722 people in Northern Ireland – 90% of the adult population – have made use of a charitable or voluntary service in the past 12 months. New research released by the Northern Ireland Council for Voluntary Action – NICVA –reveals the breadth and scope of the voluntary, community and social enterprise sector in Northern Ireland. The research also reveals that married couples, those with higher incomes and those aged over-35 are more likely to have made use of a charitable or voluntary service. However, the figures also reveal that people in Belfast or in lower income groups are more likely to view the services they receive as ‘essential’ to their day-to-day lives. The voluntary and community sector is also ranked by the public as the most informed to speak out about issues facing society. This rises to 93% among people who are married or cohabiting and drops to 87% of those who are single. 83% of all residents feel they have gained a benefit from a charity or voluntary service. This rises to 84% among those who are single. This rises to 87% in Belfast City and 88% in the South. In the North of Northern Ireland, the figure is 65%. 63% believe the services provided by charities and voluntary organisations are ‘important’ in their lives. 13% of all residents say that services are ‘essential’. This raises to 24% in the most deprived areas. 45% of all respondents answered that charities and voluntary organisations are the most informed to speak out about issues facing society. MPs and MLAs scored 16%, councillors 13% and the media just 7%. 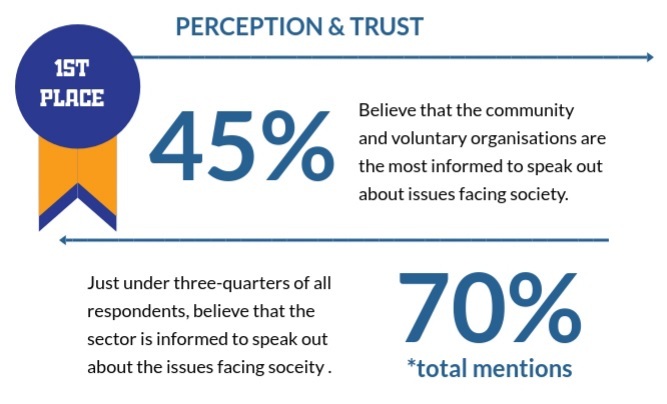 70% of all respondents mentioned charities and voluntary organisations as one of the most informed to speak out. “That voluntary and community organisations touch the lives of nine in ten people is an indication of the sector’s scope and importance, taking in organisations operating in the area of sports, youth, health, education, after-school clubs and community groups to foodbanks and church groups. “While the better off are more likely to use services, those on lower incomes are more likely to suffer if they are removed. Big changes in the form of Brexit, possible direct rule, a reforming Programme for Government and an increasing population mean that the sector must stake its place. NICVA holds its AGM for its 1,100 member organisations on Friday (8 December) with the theme of Projecting and protecting the voluntary and community sector and its reputation. Broadcast journalist Sarah Travers and Stephen Dunmore, CEO of the Fundraising Regulator, are the keynote speakers.